It's a gray overcast, windy Sunday in San Francisco (like most summer days) so why not spend it outside in the Presidio! Which is exactly what the SO and I did when we ventured out to experience Off The Grid's Picnic in the Presidio event held every Sunday 11-4pm in one of the foggiest and chilliest parts of town. But hey, we are used to this weather so no big whoop. Plus I'm wearing my 20 or so layers--we'll be fine. By the time we get there, the place is jumping and the main parade lawn area is mostly packed with folks, kids and dogs--camped out, picnicking on the damp ground. Yeah, not my idea of a super fun time but the surrounding buildings have porches with tables and chairs set up that are free to sit at, so that saves us from trying to find a place to sit (like I'm gonna do wet grass anyway). And with a fair number of food trucks and even more tent covered stalls offering up bites to eat, me and the SO were bound to find something we could eat. We made the rounds to check out whats what and as sometimes happens, the first place we came across was the vendor we ended back at. 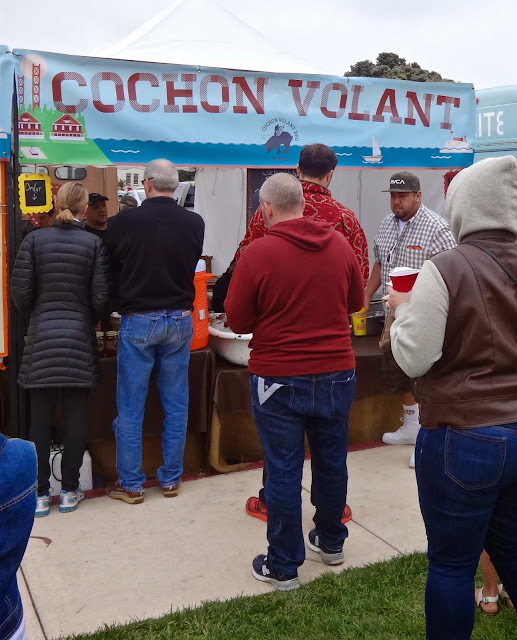 Cochon Valant--a Sonoma based barbecue outfit that does catering and events such as this around the Bay Area. It's a small select menu that offers up brisket, pulled pork and pork ribs in a few variations. Since I'm all about the pig I'm honing in on those dishes. And what better way to kick it off than with some ribs. Baby back ribs, dry rubbed with their own special "secret" seasoning then smoked tender and covered in their own brand of Sonoma BBQ Sauce served with a side of cole slaw and pickled purple onions for $10. In the grand scheme of food stall/truck pricing it's not bad and you do get 3 very large portions. The meat pulled off the bone easily and was tender to the bite. It had a nice little bark crust on the outside and only a slight smoky flavor. Enough to know it's there but not overwhelming enough to take away from the flavor of the meat. Sometimes I'm not the biggest fan of sauces, more of a straight up meat purist, but this one was okay. It fell more to spicy Texas sauce side without too much spicy to make it like a hot sauce--more like a tang with small notes of sweet. They pour it over the top before you get it. Had I thought about it I'd have asked for it on the side for dipping so I could taste more of the seasoning and the meat. If you get this I'd suggest that, otherwise it was a tasty enough riff on pork ribs that I was happy with my choice. The cole slaw was the touch of mayo variety and while pleasant and crunchy, it desperately needed some seasoning, or at the most, pepper to enliven it up a bit. Still, it served as an okay side dish to the ribs. Next up was something I honestly got for the sheer novelty value. 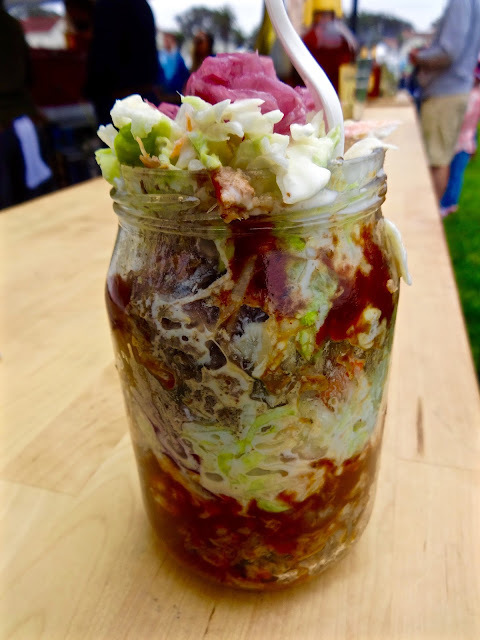 It was listed on the menu as BBQ Parfait (big jar of meat) and that is exactly what you get. Alternating layers of pulled pork shoulder that has been brined and smoked, sauce and cole slaw with a pickled onion topping for $12. It's an Atkins meal in a jar or a pulled pork sandwich without the bread--however you want to look at it. I had them go easy on the sauce here which is a good idea considering all the wet you are gonna get here. I will say they did fill it pretty well and you get a healthy serving of meat to go with all that slaw. The pork was tender and juicy and came in large pulled chunks. More than enough to get meat in every mouthful. It was odd and inventive and both me and the SO liked it. You aren't necessarily getting more meat here than you would in the pulled pork sandwiches they make, so I'm guessing the extra $2 is because you get to keep the jar--which is a decent sized Mason one you could always reuse for whatever your Etsy mind can think of. It's weird and tasty and you can tell everyone you ate a jar of meat, so if you are going to try them you may as well get this instead of the sandwich--save the carbs for something else. All in all Cochon Volant was a winner for both me and the SO and how often can I say that. 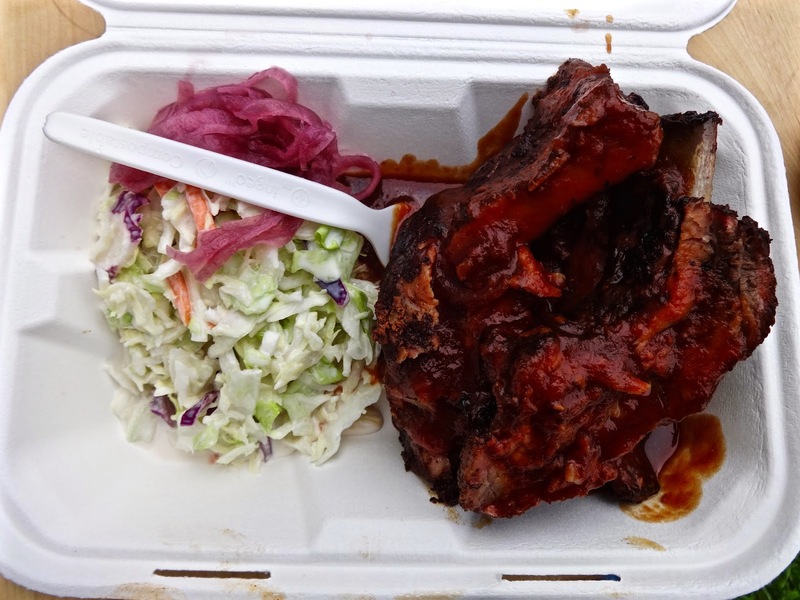 They are serving up tasty smoked pork at decent prices and hearty portions. Thus they will totally fit right into your new Paleo diet. From their brisket to their ribs to their meat in a jar for goodness sakes! They are truly for the pork lover in you. I absolutely love that more and more places cater for paleo enthusiasts like myself! The point of the Paleo diet is, and I feel some people forget this, to not only diet, but to eat delicious foods at the same time. It's the only diet I've come across that cuts out food groups, yet still focusses on everyone's need to eat great food.